Perhaps this was a rough year or a difficult few months. Perhaps your family is struggling because of the recession, or perhaps there have been some challenging family issues recently. Maybe it is difficult to be thankful this week--or at least to the extent you have been before. We all know the story of the first Thanksgiving, with the pilgrims and the Native Americans and all that. But Thanksgiving didn't become a holiday then; the holiday actually began in 1777. It was the middle of the Revolutionary War and a pretty bleak time for those on the American side. (Rather than a feast in 1776, two days were set aside for prayer and fasting.) Philadelphia fell to the British on September 26 and John Adams wrote dolefully that "The prospect is chilling, on every Side: Gloomy, dark, melancholy, and dispiriting." Worse news followed. More battles lost. A brutal "massacre" where over 300 American soldiers were killed and 100 taken hostage. They were so very grateful that day, grateful in spite of the harsh winters and the many, many soldiers who were not celebrating with them, grateful in spite of the famines and the rations, grateful in spite of the destruction the war had wrought and of the new grief that families bore. Similarly, when Lincoln declared a day of Thanksgiving in October of 1863, the nation had just seen a brutal war. The land was ravaged, the people sharply divisive, nurturing wounds on their bodies and in their hearts. Innumerable soldiers had died in the war and America had nearly torn herself to pieces. A lot to be thankful for, no? But Lincoln acknowledged the gifts of God in the midst of it: "They are the gracious gifts of the Most High God, who, while dealing with us in anger for our sins, has nevertheless remembered mercy." Perhaps our troubles do not seem as bad as they have in years past. And no matter what, as Lincoln said, let us remember to be thankful to God for his mercies. The one thing we need has been and will always be met: a Savior to rescue, redeem, and restore us. That's something to be thankful for, no matter what else is going on in the world. 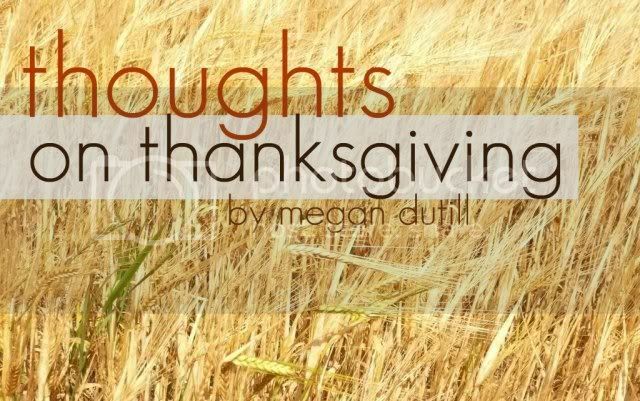 "The one who offers thanksgiving as his sacrifice glorifies me." I really needed this right now. It has been a really tough and lonely year. I needed to be reminded that I still have things to be thankful for. And God still deserves my thanks. This is a cool online magazine. Keep it up.